The production and administration building of the company Scheidegg received the award for “Exemplary Building”. The new building reflects the companies precise attitude to its work. Accurate lines and details were the basis for envisioning this attitude. The “La-Ferte-Steg” has been awarded with the German Bridge Design Award. Unanimously, the jury has nominated the “La-Ferte-Steg” in Stuttgart as the winner in the category pedestrian bridges. The “La-Ferte-Steg” is a particularly harmonious engineering structure, which is fully convinced in every detail and has an excellent fit into its surroundings. The designer Dr.-Ing. Matthias Schüller receives the prize for his outstanding engineering achievement. The October calendar page of the Jubilee 2006 calendar shows the airport tower Dusseldorf. 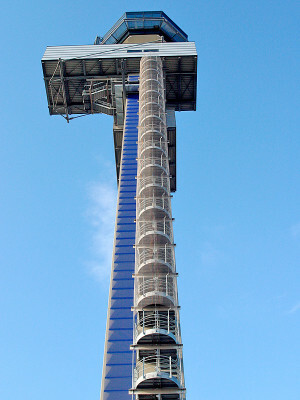 The Tower was a 2-storey floor building planned by us and completed in 2002. The first Tour on Saturday, September, 09 th 2006 is leading to objects of the engineering offices Leonhardt, Andrä und Partner, and Peter and Lochner. For more information please contact the Chamber of Engineers or the Engineering Academy. Inauguration of the Sports- and Assembly Hall in Stuttgart-Münster on September, 25th 2006. The hall consists of a three-storey building – mainly built of reinforced concrete. The roof was build as steel composite construction. aus der Vorstellung der Landschaftsarchitekten, weg vom üblichen Baumgrün eine Großskulptur mit unregelmäßiger “Feinstruktur” zu schaffen. Mit einfachsten Mitteln aus verzinktem Betonstahl von 20 mm Durchmesser hergestellt, wird die schlanke, biegeweiche “Masche”, an den Knotenpunkten verknüpft, im Endzustand zur stabilen Gitterschale. Das Objekt erhielt beim Verzinkerpreis 2004 eine Anerkennung. Article in the journal “Consulting engineers”, edition June 2006. 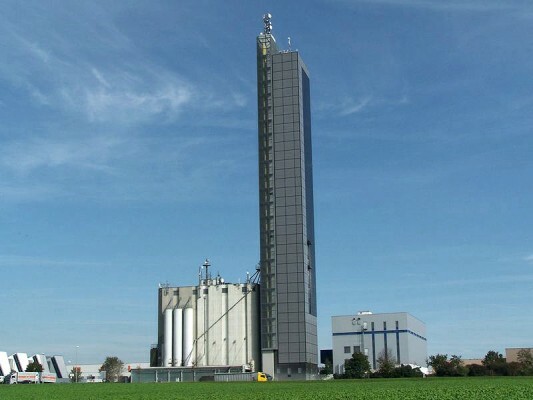 The article reports about the new silo building for Schapfenmühle in Ulm-Jungingen, built in 2004. After 14 months of construction, the arena was opened on 27 May 2006 with a ceremony. The new event hall is located in Stuttgart Bad Cannstatt close to the “Hanns-Martin-Schleyer Halle”. The two buildings are connected through a foyer. The Arena has the dimensions of 135 x 95 m with four full storeys. Depending on the event up to 7.500 visitors can be seated in the Porsche Arena. Peter and Lochner developed the structural design of this multi-functional hall. 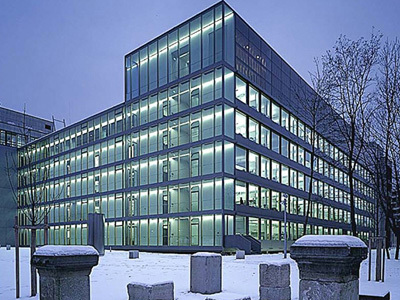 For the extension of building in Bavaria, Munich, Germany Peter and Lochner takes over the structural design. The client is the “Bavarian Health Insurance Association” in Munich. The project includes an administrative building with six floors above ground and two underground floors, a reinforced concrete frame construction with built-in service units and an attic build as a steel skeleton construction with trusses. Commissioned by IBAU, Hamburg Peter & Lochner is planning a Raw-Meal-Silo made of prestressed concrete in Turkey.